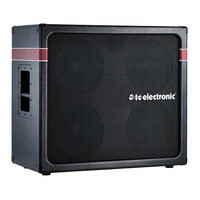 The TC Electronics K-410 Bass Cabinet is a lightweight and portable 4 x 10″ bass speaker cabinet that not only looks great but sounds it two. Loaded with 4 custom made 10 inch TC Electronic and Lavoce drivers the K-410 produces a beefy and defined low end whilst the 1 inch ceramic tweeter handles pop and clarity. With an impedance of 8 Ohms and the ability to be stacked either vertically or horizontally the K-410 is a powerful and versatile 600W bass speaker cabinet.